One look at this wine cooler and you can’t help but wonder whether or not a real wine enthusiast had a hand in its design and production, even more so when you plug it in and start exploring its features and functionality. Taking into account the functional and contemporary design, its 18-bottle capacity, and its set of features and functions, it hardly gets any better than this as far as practical wine coolers go. 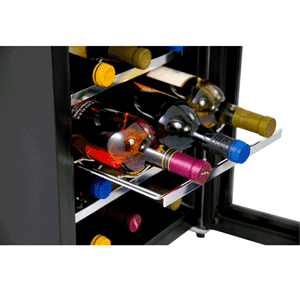 This is truly a wine cooler built for real wine enthusiasts that are looking for something that does its job of optimally storing wines well. After gathering practical information to complete this NewAir AW-181E 18 Bottle Wine Cooler review, we’ll go as far as dubbing this a top-of-the-line cooler any serious wine enthusiast would likely aspire to owning. Starting with its design profile, any kitchen, dining room, man-cave, home or commercial bar will undoubtedly look much better with the addition of this unit which accentuates just about any space it’s placed in. This is because design-wise, this cooler manages to strike the perfect balance between stylish and not being too overbearing. In other words, it looks good, simple and stylish, but doesn’t stand out too much and aesthetically overpower its surroundings. The unit’s exterior is dominated by a stainless steel body with a nice black finish, while the blue interior illumination adds an air of classy sophistication. The designers couldn’t have chosen a better color than black for the beautiful cabinets as they complement the stainless steel-trimmed racks extremely well. This cooler’s freestanding profile makes it very flexible by way of placement options and has a sizeable standard capacity of 18 bottles. It is indeed a single temperature zone cooler that uses a thermoelectric cooling system which is free of coolants or harmful chemicals. You get a one year manufacturer’s limited warranty to peacefully enjoy lasting operation of your earth-friendly wine cooler. The unit’s fans output a noise level of 25dB, which is definitely bearable for a 14” (D) x 19.38 (W) x 25.75 (H) cooling appliance. It weighs 33.9 lbs. (not that that really matters because you won’t be moving it around much, if at all) and operates on 120volts. This is an ETL certified wine cooler. The elegant soft blue interior light is perhaps more for visual appeal than anything else, because it only effectively lights up the top row of the cooler (3 bottles), but even then the shelves are tightly packed together so you can’t view the labels while the bottles are packed in. This is no bother though because what this ultimately means is that you get a higher capacity than what is usually offered by wine coolers of this size. 18 of your bottles can be stored and chilled at their optimal wine storage temperatures and you get a decent temperature range of between 54 and 66 degrees Fahrenheit. This means that you have ample range within which to store both your red and white wines, although some of your sweeter reds probably fall outside of the minimum temperature setting of 54 degrees. It’s very easy to manipulate the temperature settings too using the up/down intuitive temperature control buttons. Each up/down push increases or decreased the temperature very conveniently by 1 degree. This is convenient in perhaps the most important way to real wine enthusiasts, especially if you’ve previously owned a different wine cooler and had to spend a considerable amount of time going up and down with your “free-flowing” temperature adjustments of coolers from other manufacturers. If you want to save a bit (a tiny bit which could add up) of power consumption by switching off the LED light (which is really only for visual appeal anyway), you simply use the integrated light button. 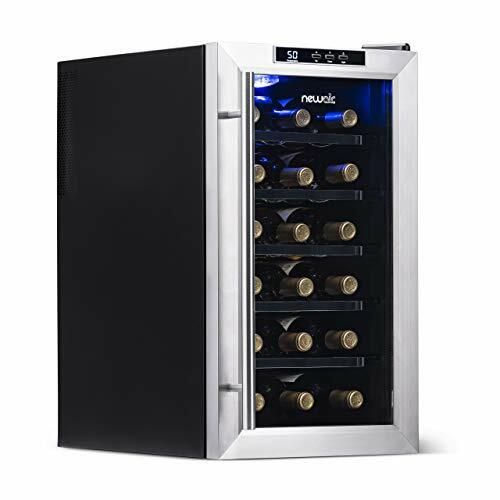 There is very little fault to find in this refrigerator and we can truly vouch for it as one of the best options in wine coolers for real wine enthusiasts. This “real” wine enthusiast-specific suitability shines through when this cooler is put through its paces in “real” world deployment, not just in theory. A not-so-good feature associated with thermoelectric coolers is their dependence on the ambient room temperature, often only cooling within 20-25 degrees of the ambient air temperature, as is the case with the Avanti 12 Bottle Thermoelectric Counter Top Wine Cooler. This baby shatters that apparent thermoelectric cooler limitation and can hold temperatures of around 60-61 degrees when it gets really hot and the subsequent ambient temperature goes well into the 90s. Our NewAir AW-181E 18 Bottle Wine Cooler review proves this unit to be one of the most effective ways to store, chill, and display your wines, whether you’re a beginner wine collector with a growing collection or indeed if you’re a seasoned wine connoisseur with a specialist collection. 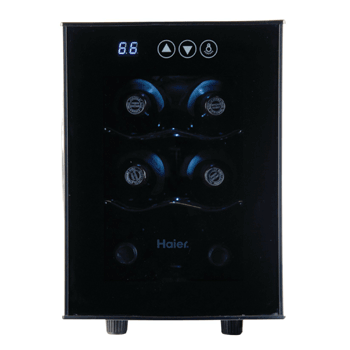 It conveniently chills your favourites at their optimal temperatures and actually works out cheaper than other wine coolers in its classification category. You pretty much get all the features you’d get in more expensive coolers from other manufacturers. 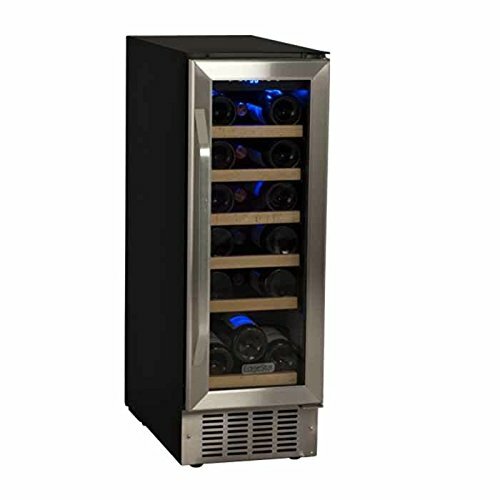 This is perhaps not a wine cooler meant for commercial use however, but it’s almost perfectly built for domestic use and will easily and effectively chill up to 18 of your bottles for a considerable amount of time.